Global markets provided mixed returns in July amid heightening geopolitical risk and increasing concern that the US Fed and the Bank of England could raise policy rates sooner than previously expected. But for Canadian investors with unhedged portfolios of global ETFs, it was a highly profitable month. This was true because of the sharp depreciation of the Canadian dollar (CAD) versus the USD, which added to returns on foreign currency denominated ETFs in CAD terms. Global equity market ETFs were mixed in July. Canadian, Emerging Market and Japanese equity ETFs posted gains, while Eurozone and US small-cap stocks were down. Global bonds were also mixed, with Emerging Market bonds posting gains and Eurozone bonds posting losses in USD terms, but all bond ETFs showing solid gains in CAD terms. Despite growing geopolitical risk emanating from Emerging Markets, EM assets were the strongest performers in July. Gold and commodity ETFs were among the biggest losers. Energy prices weakened as the WTI crude oil futures price fell to $98/bbl at the end of July. The IMF further reduced its global growth forecasts for 2014 as did several central banks, but the US economy posted a stronger than expected 2Q rebound and economists remain upbeat on 2H14 US growth. Global inflation showed mixed signals, with inflation firming in the US, UK and Canada, but weakening further in Europe. On the central bank front, the Bank of England warned that markets were too sanguine about the timing of a BoE policy rate hike and then back-peddled, while the US Fed continued to taper its QE program but tried to reassure markets that it is in no hurry to raise its policy rate. Fed Chair Janet Yellen maintains that considerable slack remains in the labor market and is waiting for signs of stronger wage growth. Members of the FOMC remain divided on how soon and how much the policy rate should be raised. The ECB eased policy further but stopped short of outright Quantitative Easing. The BoJ remains committed to its massive QE program. Bank of Canada Governor Poloz continues to signal confidence in a soft-landing for Canada’s inflated housing market and no interest in tightening monetary policy any time soon. The S&P500 closed July at 1931, down from 1960 at the end of June. 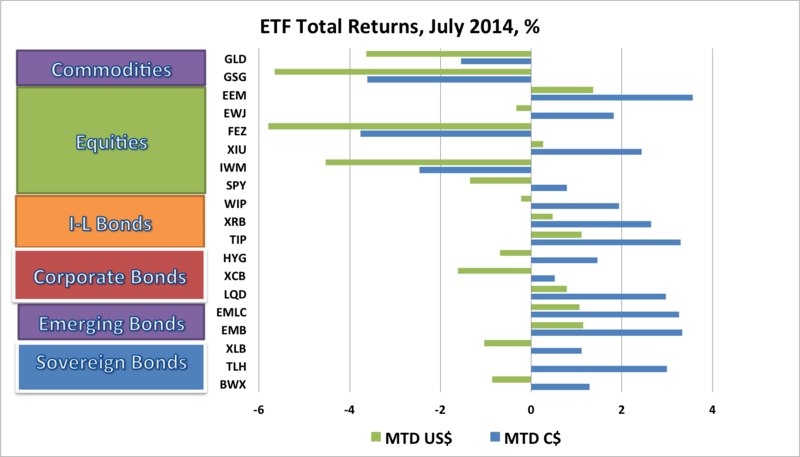 Global equity ETFs posted mixed returns in July. 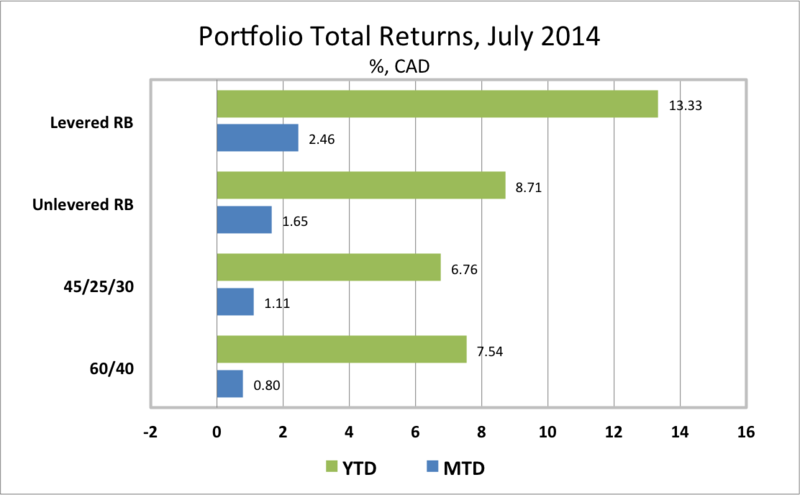 The C$ weakened 2.1% vs. USD in July, raising Canadian dollar returns on USD denominated ETFs. Emerging Market equities (EEM) provided the strongest returns among the equity ETFs we track, gaining 3.6% in CAD terms. Canadian equities returned 2.4%, while Japanese equities (EWJ) returned 1.8% in CAD terms. US Large Cap (SPY) fell 1.3% in USD terms but posted a positive return of 0.8%, in CAD terms. The worst performers were Eurozone equities (FEZ), which returned -3.8% in CAD terms, while US small caps (IWM) also posted a sizable loss, returning -2.5%. Commodity ETFs lost ground in July. The Gold ETF (GLD) returned -1.5% in CAD terms, while the GSCI commodity ETF (GSG) returned -3.6%. Global bond ETFs posted solid returns in CAD terms, boosted by the strength of foreign currencies. ETFs with positive returns in July included USD-denominated Emerging Market bonds (EMB) and EM Local Currency Bonds (EMLC), which both returned 3.3% in CAD terms, the US long government bond (TLH), which returned 3.0%, and Canadian Long Government bonds (XLB), which posted a 1.1% return. Non-US government bonds (BWX) performed poorly, returning -0.9% in USD terms as peripheral European bonds weakened, but still managed a 1.3% gain in CAD terms. North American inflation-linked bonds (ILBs) posted positive returns in July as inflation showed more signs of turning up. Canadian RRBs (XRB) returned 2.7%, while US TIPs (TIP) returned 3.3% in CAD terms. Non-US ILBs (WIP) returned 1.9%. Corporate bonds underperformed government bonds in July as US investment grade (LQD) and high yield (HYG) bonds returned 3.0% and 1.5% respectively, in CAD terms. Canadian corporate bonds (XCB) returned 0.5%. In the first seven months of 2014, with the Canadian dollar depreciating 2.5% against the US dollar, the best global ETF returns for Canadian investors were in Canadian equities (XIU), Canadian inflation linked bonds (XRB), and USD-denominated Emerging Market bonds. The worst returns were in US small cap equities (IWM). In global equities, the Canadian equity ETF (XIU) performed best, returning 14.0% year-to-date (ytd). Emerging Market equities (EEM), which suffered early in the year from Fed tapering, political turmoil, and China’s growth slowdown, rebounded to return 8.3% ytd in CAD terms. The S&P500 ETF (SPY), which hit record highs in July before selling off sharply at the end of the month, returned 7.7% in CAD terms. The Japanese equity ETF (EWJ) returned 2.0%. The Eurozone equity ETF (FEZ), which had been the top performer through May, suffered from geopolitical tensions and currency weakness in June and July and has returned just 1.3% year-to-date (ytd) in CAD terms. US small caps (IWM), after another sharp selloff in July, returned just 0.7% ytd in CAD terms. 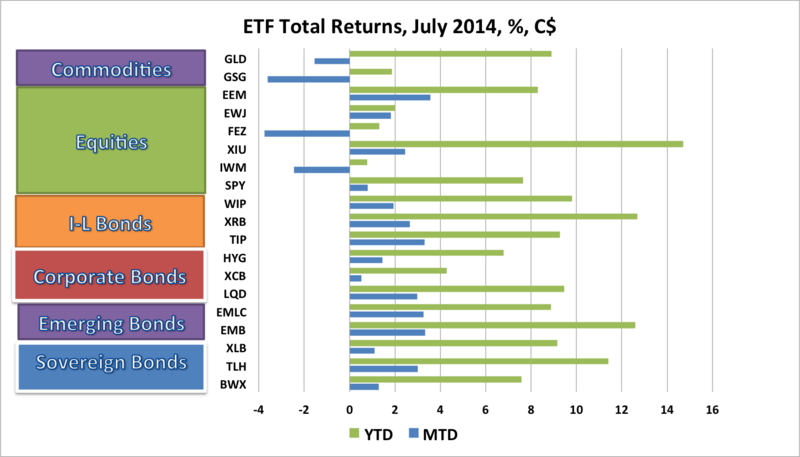 Commodity ETFs had poor performance in July, dragging down year-to-date returns. The Gold ETF (GLD) has returned 8.9% ytd in CAD terms, while the GSCI commodity ETF (GSG) returned 1.9%. Global Bond ETFs continued to perform extremely well for Canadian investors in the year-to-date through May. Foreign bond ETFs have benefited from a combination of weaker than expected global growth, accommodative central bank policies and safe haven demand. The US long bond ETF (TLH) returned 11.4% ytd in CAD terms. USD-denominated Emerging Market bonds (EMB) returned an even more impressive 12.6%. The Canada Long Bond ETF (XLB) posted a gain of +9.2%. Emerging Market local currency bonds (EMLC) suffered from the same problems as EM equities earlier in the year, but rebounded to return 8.9% in CAD terms. Non-US global government bonds (BWX) posted a return of 7.6%. Inflation-linked bonds (ILBs) also turned in strong year-to-date gains after a disastrous performance in 2013. The Canadian real return bond ETF (XRB) fared best, benefiting from its long duration, returning 12.7% ytd. Non-US ILBs (WIP) returned 9.8% in CAD terms, while US TIPs (TIP) returned 9.3%. In corporate bonds, the US investment grade bond ETF (LQD) returned 9.5% ytd in CAD terms, while the US high yield bond ETF (HYG) posted a return of 6.8% as high yield spreads widened. The Canadian corporate bond ETF (XCB) returned 4.3%. In July, the Global ETF portfolios tracked in this blog posted surprisingly strong gains, adding to positive year-to-date returns, aided immensely by the weakness of the Canadian dollar. The traditional Canadian 60% Equity/40% Bond ETF Portfolio gained 80 basis points in July to be up 7.5% ytd. A less volatile portfolio for cautious investors, comprised of 45% global equities, 25% government and corporate bonds and 30% cash, gained 111 bps in May to be up 6.8% ytd. Risk balanced portfolios also posted robust gains in July. A Levered Global Risk Balanced (RB) Portfolio, which uses leverage to balance the expected risk contribution from the Global Market ETFs, gained 246 bps in July, boosting to its year-to-date gain to 13.3%. An Unlevered Global Risk Balanced (RB) Portfolio, which has less exposure to government bonds, ILBs and commodities but more exposure to corporate credit and emerging market bonds, returned 165 bps in July to be up 8.7% ytd. The final week of July was a bad one with every ETF we follow declining in local currency terms. Conflict continued unabated in Gaza, East Ukraine, Syria and Iraq. Sanctions on Russia were intensified after the tragic downing of ML17. Argentina was declared in default on its foreign law bonds. The Fed continued to taper QE and tried to reassure markets that the policy rate would remain on hold for an extended period, but strong economic data convinced many that the Fed will have to signal a shift in policy before long. Inflation in the Eurozone fell to 0.4%, while the US Employment Cost Index rose faster than expected. After an extended period of sustained strength, global bond markets are uncertain and growing nervous about the timing of central bank tightening in the US and UK. US labor market developments will be a key focus because that is what Fed Chair Yellen is watching. A strong July employment report and evidence that wages are beginning to accelerate could extend the bond market sell-off. US dollar strength is being generated both by safe haven flows amid geopolitical turmoil and the divergence between renewed optimism on US growth and continued sluggish growth in key trading partners including the Eurozone, Japan and Canada. Fallout from intensified Russian sanctions and the conflict in Gaza pose the most acute geopolitical risks, with neither Putin nor Netanyahu showing signs of willingness to back down. The Bank of Canada appears to be firmly on hold, content to let the Fed and the Bank of England to the lead in the next round of policy rate tightening. Further weakening of the Canadian dollar will be tolerated. US 2Q corporate earnings growth beat expectations (as usual), but the stronger labor market and faster wage growth desired by the Fed will squeeze margins unless demand also strengthens meaningfully. If it does not, equities will be in trouble in a rising interest rate environment. Concerns about global inflation are more balanced than earlier this year. Markets will carefully watch for signs of a continuing divergence between the Eurozone and US. Emerging markets ETFs rebounded strongly from weakness early in the year. Global asset allocation strategists encouraged investors to shift into EM assets, which had become relatively cheap. But with geopolitical risks concentrated in EM and the Fed ending QE in coming months, the outlook for EM assets remains uncertain, as demonstrated by the sell-off in the final week of July. As it turned out, the unstable disequilibrium appears to shifting, at least in the short term, toward stronger growth, higher inflation in the US, UK and Canada, and less accommodative central banks in those countries. The hint of this shift damaged risk assets at the end of July and could be a portent of things to come. While the ample cash dampened July returns in my desired portfolio, it helped in the final week of the month and will help in August if the shift mentioned above gains momentum.